Proceed With Caution With These Ab Exercises! We've already talked about the best ab exercises, so now what makes the list for the worst ab exercises? I will share with you a few that make my list and would be interested to hear what you would rate as the worst ab exercise. As a Physical Therapist, I believe that the risks outweigh the benefits for any abdominal exercise that places increased strain and stress on your lower back. Since 80% of people will have back pain at some point in their lifetime (1), it is wise to proceed with caution. I always say, "Better safe than sorry!" I also believe that if you are going to take the time and energy to do any exercise, you should make it as effective as possible. Getting the "biggest bang for your buck" so to speak. So, if an exercise has been shown to have little effectiveness, then why waste your time doing it when there are plenty of other exercises to take its place. So taking that into account, let's look at a few of my picks for the worst ab exercises. 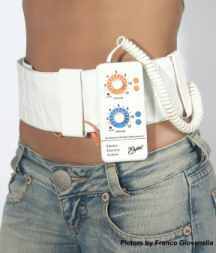 We've heard many infomercials promising results without effort, if only you will use an electronic ab stimulator. Sounds too good to be true, right? Well, I have found that if it sounds too good to be true, it probably is. To determine the effectiveness of the electronic ab stimulator, a research study was done by the University of Wisconsin, La Crosse, led by Dr. John Porcari (1). They had their volunteers undergo EMS training three times a week for 8 weeks using a popular EMS machine on the market. Not only were there no significant results after 8 weeks (no changes in weight, body-fat %, strength or overall appearance), but it was also found to be painful. In order to be effective at 80% of the person's maximum voluntary effort, the machine had to be turned up to a point that caused pain. Doesn't sound like much fun to me! The machine they used cost $500 and also took significant time to complete this training. For the same price, they could have purchased a gym membership, a piece of home equipment or time with a personal trainer and possibly had much better results doing traditional cardio and strength training! This is still a popular exercise among some people. You hold a bar behind your neck, bend over until your back is parallel with the floor and then twist side to side. Even though this exercise does work your obliques, it also puts significant strain on your back. It has been found that there is increased stress on the discs in the lower back in these positions: forward bending, sitting and twisting. There is twice as much pressure on your back in sitting than standing and 7-10x as much pressure on your back when bent over (3). This exercise is performed in one of the worst positions for the back...forward bending combined with twisting. Definitely one I would suggest, especially if you suffer from lower back pain. Try an exercise like the plank instead. I know that this is a favorite of many, but the reason I chose to put this on my list is due to faulty technique and effectiveness. When doing a full sit-up, it's easy to use primarily the hip flexor muscles instead of the abdominal muscles. There are people who like the Ab Rocker and get good results from it. I chose it simply because it ended up on the bottom of the list for effective abs exercises for both the rectus abs and the oblique abs in the research study done by Peter Francis. See the entire list here. What Do You Think is the Worst Ab Exercise? 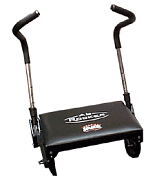 There are plenty to choose from with all the abs gimmicks and abs exercise equipment out there. Which abs exercise do you think is the worst? Either the worst for comfort, the worst for results or the worst for any other reason you can think of! Share your opinion! *Note* After you enter your submission for the worst abs exercises, you will get a link to download the PDF version of my Favorite Abs Exercises on a Ball! causes pain in my tailbone and lower back. I dont like these ab exercises.